In order that I can concentrate fully on my patients, I do not make any appointments by phone or mail. Therefore, please make appointments, cancellations or postponements exclusively on my online reservation system. This also functions with tablets and smart phones. Every appointment is chargeable. Appointments that are cancelled within 48 hours will be charged in full. You will also be unable to cancel on my online reservation system. I have certain buffer times reserved for emergencies so just mail me if necessary. If wished I am able to treat couples simultaneously. (The second person has to wait 15 minutes until treatment commences). I will explain to you exactly how you can make an appointment as a couple in my online reservation system during your first appointment. Select a suitable appointment in my online reservation system. I will explain to you during your first appointment on which days of the cycle further treatments would be beneficial. Activate the «Appointment Alarm» in your account. If no appointment is available within three days just send me a mail. I have certain buffer times reserved for emergencies. It is advisable to reserve 10×1 appointments per week. If it is possible for treatment to commence at the earliest requested date, just cancel the appointments no longer needed. When using the reservation system for the first time, please register by clicking «Register». Register with your Facebook or Google acount. Click on the respective symbol and then on «register». Complete the missing information. If you don’t wish to register with your Facebook or Google account, please complete the form and choose a password. 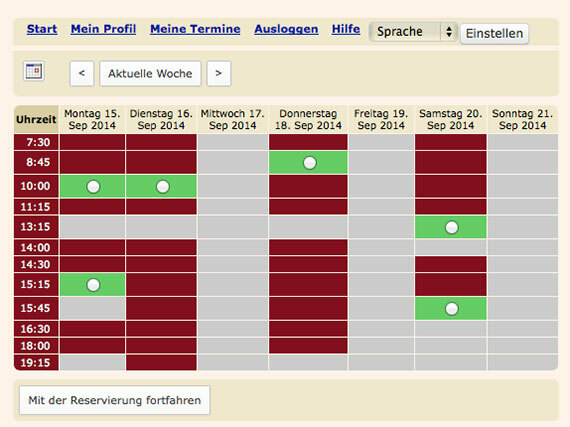 If you wish for an earlier or additional appointment click on the «appointment alarm» box. In this case you will receive an email, SMS or both (according to your preference) every time an appointment becomes available within the next 14 days. Please activate the preferred notification method: «email», «SMS», OR «email» AND «SMS». Due to several patients having activated the appointment alarm, it is possible that a particular appointment has already been reserved when you click on the link. If you no longer wish to use the appointment alarm you can deactivate it any time in your patient account. Scroll through the agenda until you find a free appointment (green) which suits you. Click on the circle. If you wish you can reserve additional appointments in the same manner. When you have clicked on all your chosen appointments, click on the button «continue with the reservation». If you have already made an appointment and wish to make it free at a later date for someone else, it will take between two and three minutes before it returns to green. Please carefully recheck all your appointments and then click in the menu on treatment grounds. If you wish you can send me a message under Comments and I will answer you by email. After a few minutes you will receive an email confirming that you have successfully registered in my online reservation system. You will find my digital visiting card in the attachment of this mail on which you can click to add to your address book. After a short time you will receive confirmation of your chosen appointments together with the corresponding ics data which can be added to your calendar with a mouse click. The omission of an email confirms that the reservation was unsuccessful! On the day before your appointment you will receive a reminder. You can chose the method («email», «SMS or «both») when registering or later under your patient account. At least one of these possibilities must be active. Click on «Login» and register with your user name and password. Click on «My Profile» in order to deactivate the appointment alarm, change the method of notification (email, SMS) or alter your address or appointment reminder settings (email or SMS). In order to view your appointments, click on «My Appointments». Click on «Details» and afterwards on «Cancel Appointment» if you wish to cancel or «Change Appointment» if you want to change to another date.